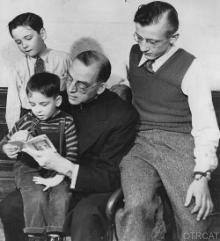 Hear dramatic reenactments of real life sagas from Boys Town, the famous orphanage founded by Father Edward J. Flanagan. Known for pioneering new methods of caring for at-risk youth, the institution made strides in its field, becoming a model for boys' homes worldwide. The true life dramas of the residents of "The City of Little Men" became powerful radio narratives, using actors in the studio and changing identifying names and details. Poignant tales of the less fortunate brought the face of Boys Town to the rest of the country. Father Flanagan concluded each show with a short personal address. The stories provide a beacon of hope, and a reminder that "no boy is a bad boy." Be the first to comment on "Father Flanagan Boys Town"